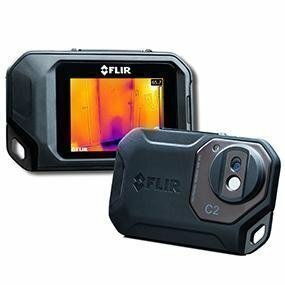 Description: The FLIR C2 is the world's first full-featured, pocket-sized thermal camera designed for a wide range of building and electrical/mechanical applications. Keep it on you so you’re ready anytime to find hidden hotspots, energy waste, structural defects, plumbing clogs, HVAC issues, and other problems. FLIR C2 makes it more affordable than ever to add the powerful advantage of thermal imaging. C2 features FLIR's unique MSX® that adds key details from the onboard visible light camera to the entire infrared image in real time. The result: an all-in-one, undiluted thermal picture with visible light features that lets you instantly recognize where the problematic heat pattern is. MSX® is real time whether watching the camera's LCD or streaming video over USB. The C2's high-sensitivity detector captures the subtle temperature differences and thermal patterns you need to find leaks and building deficiencies. The generous 45° field of view (FOV) frames in more of the scene, the way the pros see it. C2 JPEG images store 4,800 individual thermal measurements you can process using the included FLIR Tools software. Analyze, change colors palettes, and access both thermal and visual pictures to create more convincing reports. © 2018-19 CLEANERS DEPOT. ALL RIGHTS RESERVED.